Joy of joys I just spent the last 4 days cycling 400km around the Chiltern hills, lunching on generous portions, munching mini eggs, and crunching the gears up some very steep hills. This proved to be a fabulous way of preparing for Canada. And I learnt some useful stuff on the way..
2. Take more mini eggs. 3. 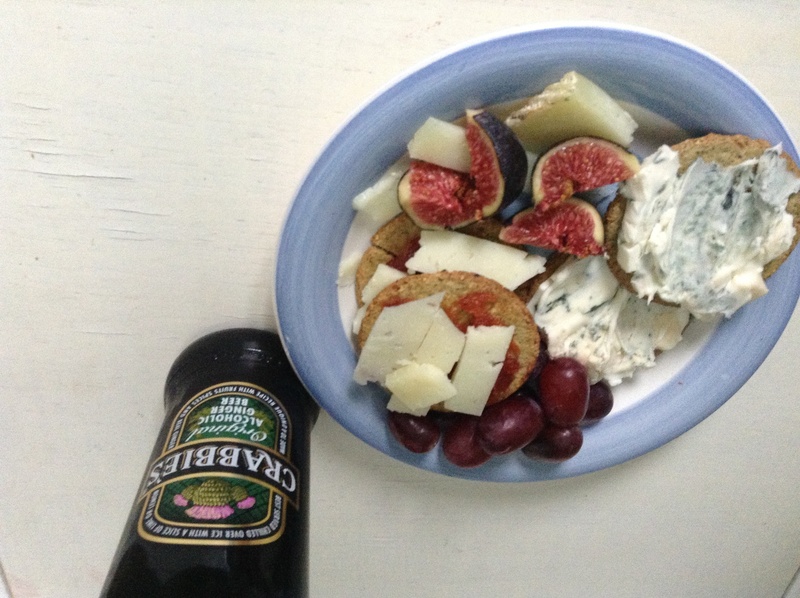 Cheese, figs and ginger beer are the ultimate post-cycling snacklet (see below). 4. I need to take a bath to Canada. Hot soak is bliss. 5. iPad / viewranger navigation is a wonderful thing indeed. 6. My legs don’t ache! Even after 400km! 7. But my hands go numb after about 350km. 8. Again, why are there not more mini eggs? 9. Fill up your water bottles. So they are full. 10. There’s no greater joy in life than whizzing along a country road, with the sun in your face and the wind at your back. 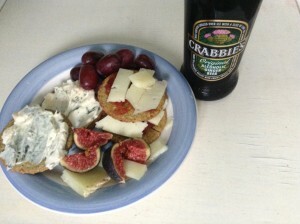 Cheese (manchego and gorgonzola) – contains vital protein for repairing muscles etc. Figs, grapes and quince paste – vitamins for vitality. Before you get too excited I should explain to new readers that my bicycle is called Monty. (50% readers now surf on) Happily, Monty has just hit a milestone as he (yes, he) has just had his racks fully loaded for the first time. To celebrate this landmark, one lucky person has won an Easter egg for guessing the weight of the Full Monty – ie the bike plus all the kit you see. A whooping 38.5kg! Some stuff is gonna have to get thrown out before I go to Canada. I’ve not been there, or done it, yet I have purchased the tshirt. 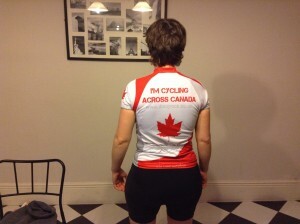 Delightfully my custom made cycling jersey arrived in the post at work today. Too excited by its contents I ripped open the package in front of my colleagues and held it up for all to see: Ta-da!! I expected the ooh and ahh reactions from colleagues usually reserved for New Year firework displays. First colleagues comments: “only the one?” With a raise of the eyebrow. Another colleague walks back to her desk. Ta-da!! I raise my jersey aloft like a prize. “You’ve only got one?” She asks. Yes, that’s right. One tshirt for 7,500km – what on earth is wrong with that? I will, erm, wash it. I will also be cycling by myself so you won’t have to sniff it. At this point, a joke is cracked about me smelling so bad that the bears will leave me be. That could be a good tactic actually but I shall have to Goggle it first. At the end of work, another colleague wanders over. She works in fulfilment and sometimes cycles to work with me so I imagine she will super impressed by my jersey. Ta-da!! You know how she responded. Yes, only the one. 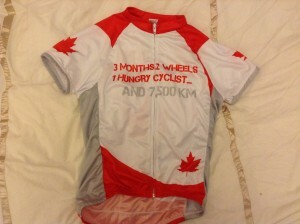 For 7,500km. My bike is an object of much beauty and affection. My bike is called Monty. I would be very sad if Monty got stolen. In fact, not only would I be sad, but were he to get stolen when I was midway across the Canadian wilderness miles from anywhere then I would, in fact, be snookered. There’s only one company that I can find that will insure my bike oversees for 100 days. I phone them. I explain my trip. The lady asks where I will be staying. 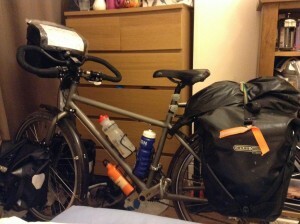 “Mostly wild camping or just plain old camping,” I explain. 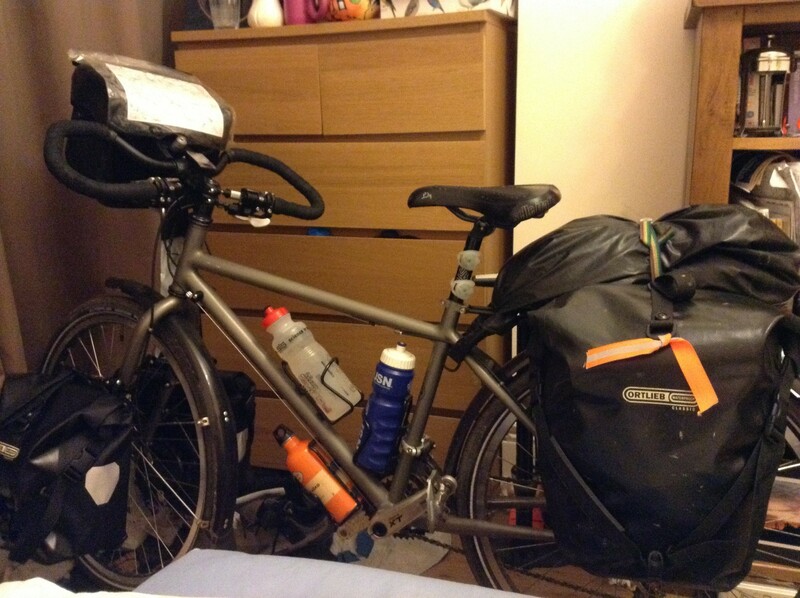 Had I known that I’d need to share my tent with my bike then I’d have purchased a larger tent. I didn’t. I purchased (or indeed was kindly gifted by Santa) a very small handmade Swedish tent. For one. So I’m not sure we’d fit very comfortably together without Monty elbowing me in the ribs and hogging the duvet. But let’s imagine that someone wants to steal my bike. Do they bring bolt cutters and slice in two my Gold rated secure D-lock? No. They snap my ultralight tent pole like a twigglet in a hungry jaw. Thus leaving me with no bike, and the flapping remains of a broken handmade Swedish tent: a happy cycle-camping tour maketh not. Hmm. The lady on the other end of the phone picks up on my incredulity. “Is there any minimum thickness of truck?” I ask, knowing that insurers are likely to find any excuse to weasel out of a claim. “No,” she replies with a chuckle. I am at this moment calculating how thin the trunk of a tree would have to be such that I can slip the appropriate lock around it, and how long it would take to chop or saw through that tree. Oh, except that would leave Monty venerable to theft by a nibbling beaver. He’d risk being carried off to dam a distant river, never to cycle again. I need a tree that’s beaver-proof. An idea flashes into my mind: I could carry a small bonsai in my panniers. Ha! That’ll catch ‘em out. A pop-up carry-along bonsai bike stand might be just the ticket. Oh, except a moose might munch it. On Christmas Day 2010 my Dad gave me a gift that started my journey across Canada: a map. I’d already thought about cycling across Canada – and made idle comments about my dream – but it wasn’t until I unwrapped that gift, unfolded it and traced my finger across the Trans Canada that the journey began. So here I am – two Christmases later and yet I still haven’t really moved anywhere. 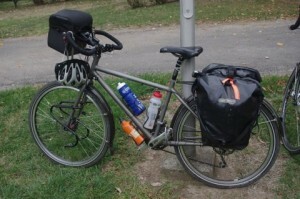 I have, however, acquired an entire family of Ortlieb pannier bags and a custom-made Roberts touring bike. The map now has tatty scuffs where it bends. I haven’t pedalled anywhere across Canada but have plotted a detailed route across that map. Now we have just turned the corner in 2013 and the start of my trip is on the horizon. I am planning on leaving at the end of May. It will take me 3 months (!) 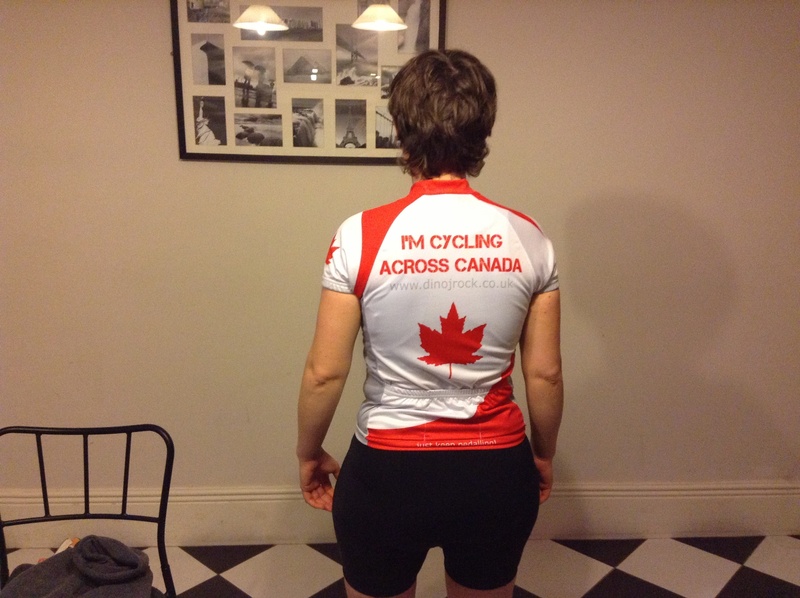 to cycle the 7,500km from Vancouver to St John’s.